A comprehensive, evidence-based resource for cardiovascular chronic disease care written for clinical, program, educational and research settings. 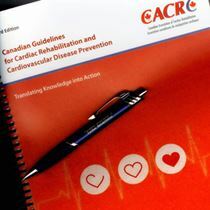 The overall objective of these evidence-informed Guidelines is to improve the clinical practice of Cardiac Rehabilitation (CR) through knowledge translation, knowledge transfer, and the professional development of health care professionals working in the field of CR, cardiology and chronic disease. This is the only resource needed for clinical and management areas of cardiac rehabilitation and chronic disease management. Guidelines for the clinical practice of those with cardiovascular or chronic diseases. Includes guidelines for the treatment of lipids, hypertension, smoking cessation, diabetes, physical activity, stroke, CHF, as well as nutrition, stress testing, exercise prescription, psychological services, program management, in-and-out-patient services and much more. There is an all new section on performance measures. Enhanced information on returning to work, special populations, basic science, epidemiology, chronic diseases/co-morbidities, future research needs, and attaining a consistent standard of care. A MUST for newer cardiac rehabilitiation programs. Web Access: log into your CACPR account (top right corner). You will see the chapters that you have paid for available under 'Guidelines'. No refunds – please make sure your purchase is correct. New textbooks that are damaged, soiled, or marked will be refunded at 75% of the new book price and shipping is at the expense of the purchaser. Defective books may be exchanged for another book at the expense of the purchaser. Proof would need to be provided. The Canadian Association of Cardiovascular Prevention and Rehabilitation (CACPR) is a national body comprised of interdisciplinary health professionals. Our focus is enhancing knowledge and clinical care, as well as enabling research for those who work in cardiovascular prevention and rehabilitation.